Synopsis: Five year old Radha's dying mother hands the custody of Radha to the devadasi Sridevi who promises henceforth she would lead a pure life. Sridevi teaches the child the virtues of a house wife. In the school Radha befriends Mohan and as they grow love blossoms between Radha and Mohan. Mohan takes her to the temple and pledges before the deity that she was his 'dharmapatni'. The lecherous Ananda Rao informs Mohan's father that his son was seeing the daughter of a harlot Sridevi. Mohan's father forces his son to marry Uma from a rich family. Uma traces Mohan's disinterest in her to Radha and leaves him. Leela, a victim of Ananda Rao saves Uma from Rao's trap. Ananda Rao murders Leela and implicates Mohan. Radha in order to save Mohan decides to meet Ananda Rao who assures her he had the evidence to prove Mohan's innocence. Finally truth gets out and Mohan is saved from the gallows. His parents accepts Radha. Uma realises her folly and unites with Mohan. Trivia: This was based on Marathi writer Vishnu Sakharam Khandekar's stories. This was made at Shalini Cinetone, Kolhapur. 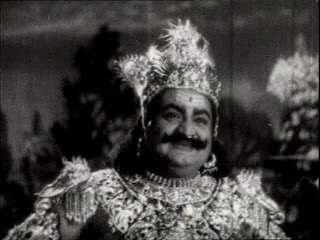 The lead actor Hanumantha Rao was son of popular stage actor Uppuluri Sanjeeva Rao. He later acted two more movies 'Bheeshma Pratigna' and 'Vandemataram' before settling down as a Municipal Health Officer in Bhimavaram. Though Viswanatha Satyanarayana was assigned to write the dialogues but since they were too grammatical, Aluri Venkata Subbarao (Chakrapani, then already popular for his Telugu translations of Bengali writer Sarathchandra Chatterjee's works) was roped in. 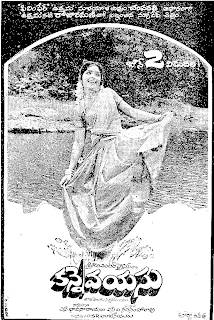 Annasaheb Mainkar composed for several musical hits in Hindi and Marathi and 'Dharmapatni' was his only Telugu film. This was debut film for ANR as an actor. He done a cameo role.